Over half the hockey season is already over, so it is only natural that the second half of the main Upper Deck set comes out! UD2 contains all the rookies that weren't in the first series, and also includes updates to team rosters. Players that were excluded from the first set are also in here. The set is basically the same as the first series with a few different insert cards available to be pulled. The Young Gun rookie cards will be a big draw as collectors try to complete their sets. Since the base cards haven't changed, they will keep the score they earned from Series One. I will say again that these base cards are absolutely gorgeous though! The design is simple and modern with outstanding photography. It's a set worth collecting. 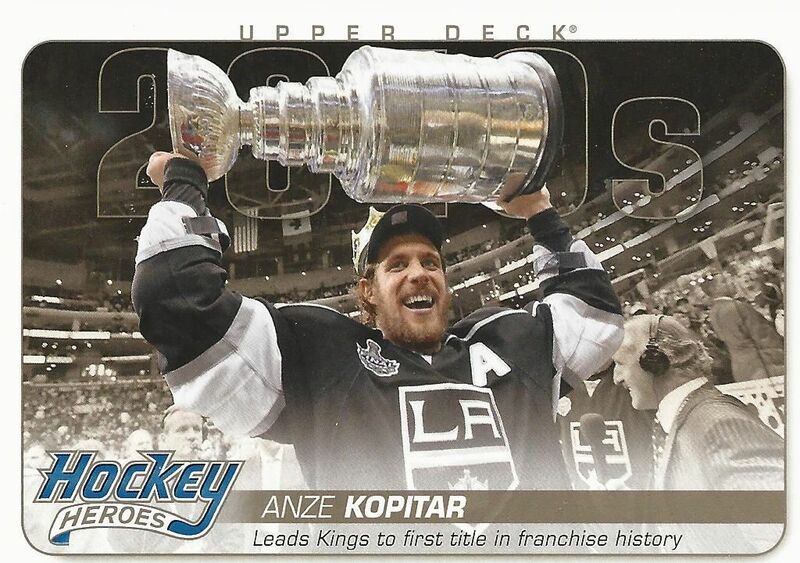 The 14/15 design is one of Upper Deck's best in years, and the images reflect the hockey season well. Collectors will have to definitely get their hands on the remaining Young Guns in this series. 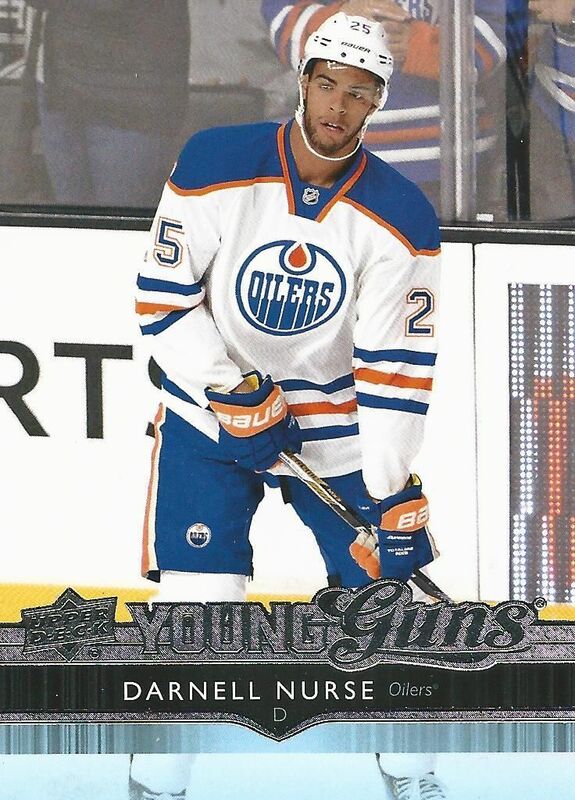 Like the base set, the Young Guns have an outstanding design that should be well-loved in the years to come. It's always fun to open up a box of Upper Deck Series Two. This set always contains a large amount of updates and inserts within the packs. Almost every pack has something in it. I think there were only a couple all-base packs when I opened up my box for review. Returning again in Series Two are the Game Jersey cards. Each box of Series Two will net you two jersey cards, but here there will be only one standard Game Jersey. Like Series One, these cards come in patch variations as well that are pretty scarce. The regular jersey cards aren't worth too much, but they make nice little hits in these boxes. 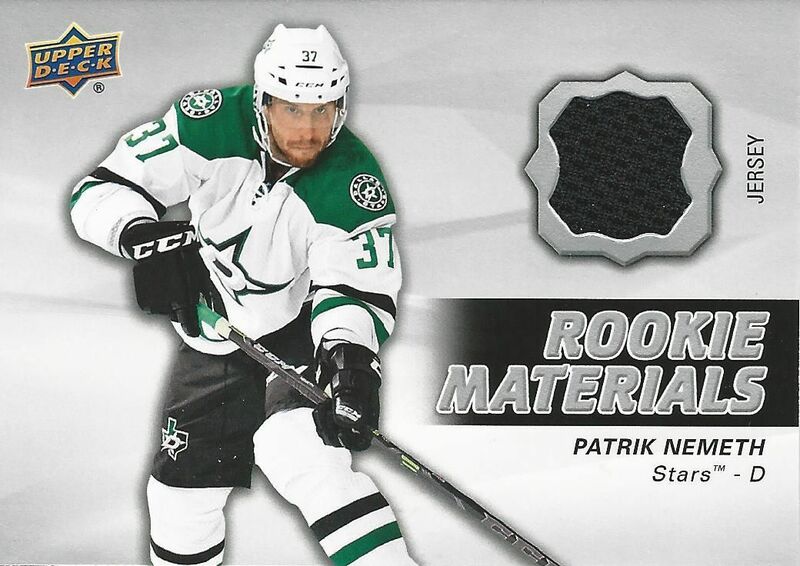 Rookie Materials are the other jersey cards found in Series Two. This insert set has been in UD2 or a long time, and the tradition continues here. The design this year is very simple...almost unadorned. I'm sure that the big rookies will be nice cards to find for collectors when they open their boxes up. My favorite insert card in Series Two are the UD Portraits cards. These cards are black and white with silver foil on them. It's a simple yet elegant look that I really like. These cards are visually stunning. You'll find both current players and NHL legends in this set. This is an insert set that I would consider collecting as the design and player selection is top notch. 2010's Hockey Heroes are in Series Two. 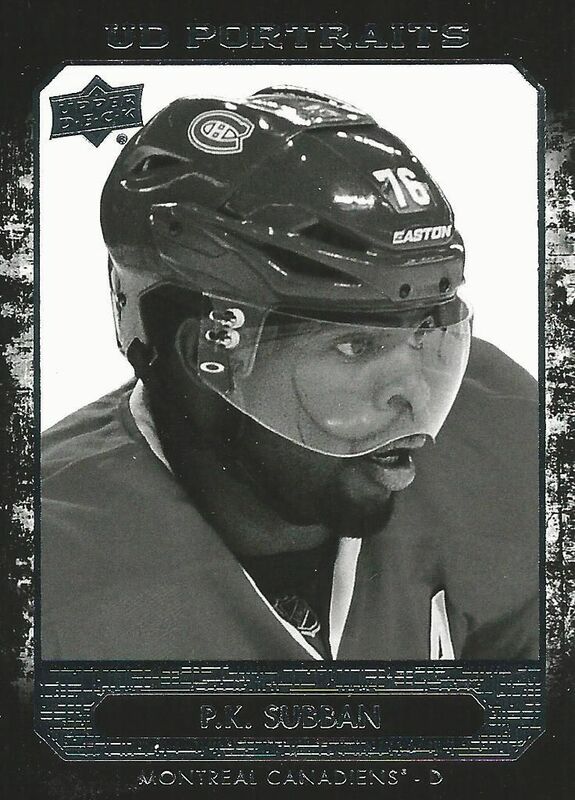 I wonder if this is the last of the Hockey Heroes cards... or will Upper Deck somehow come up with a way to do more 'Heroes'. Time will only tell! I'm totally fine with them retiring this concept though. I'm never really happen when I get these cards out of my packs. Well... unless it was autographed. The popular Canvas cards also return in Series Two. This sweet set has been a collector favorite for a few years now, and I'm sure they will continue to flock to find the Young Guns. Unlike the Hockey Heroes, I'd be fine with UD continue this set for a long while - it's great! For those of you who want to finish off the massive O-Pee-Chee set, you'll have to bust a lot of Series Two packs. Here you will find the OPC updates in both regular and retro form. Popular rookies like Jonathan Drouin are here for the pulling. 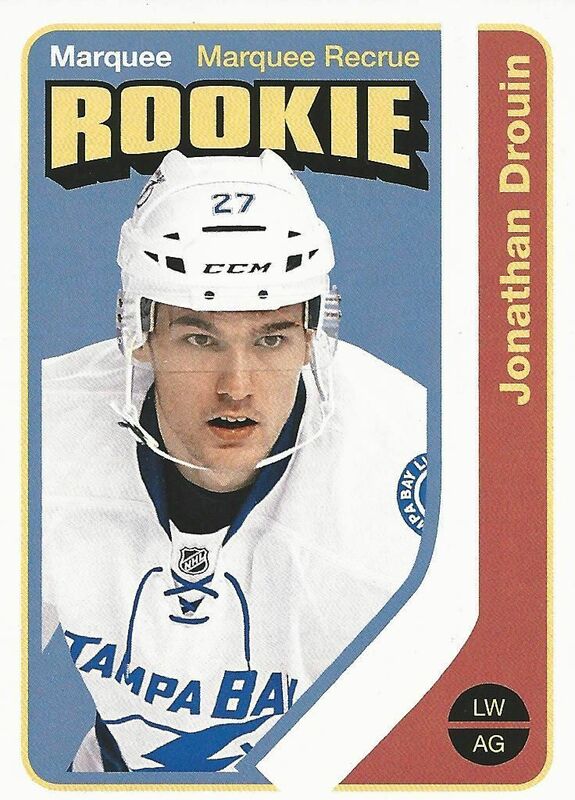 My box had both of Drouin's OPC cards - regular and retro! 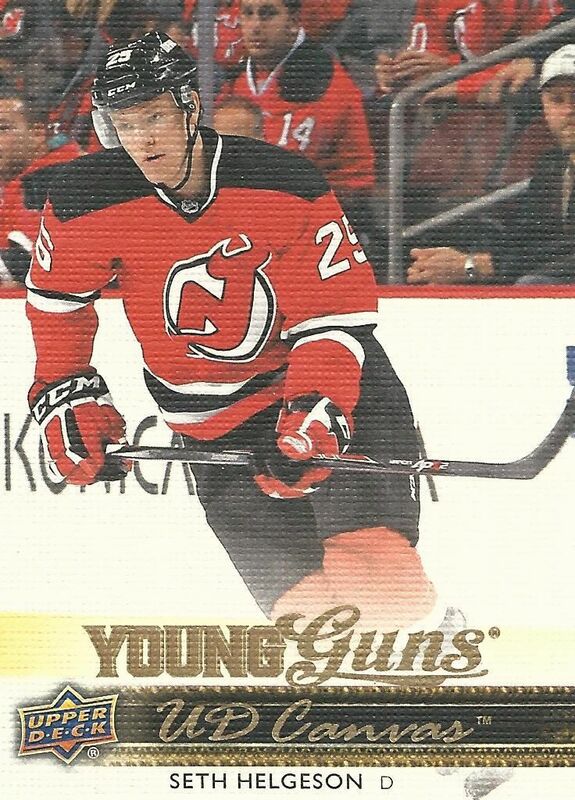 Upper Deck Series Two also features the return of acetate Young Guns and UD Signatures. Unfortunately, I didn't pull either of those rare inserts in this box. Lucky collectors can also find old Upper Deck buyback cards randomly inserted. There really is a lot of see here! Series Two gets a higher score than the first series because of this. Upper Deck Series Two is a very solid set of cards with a good amount of inserts and hits to find in boxes. The price point of the mainstay Upper Deck set has always been affordable, so purchasing boxes of it won't break the bank. I would definitely recommend getting a box or two of Upper Deck Series Two. There are plenty of great cards to find here, and finishing off the UD set would be a very nice accomplishment for any collector. This is definitely a set of cards to get your hands on. Can't wait to open a box !! Awesome Break! Always love watching your breaks! Love the Canvas Cards! Nice canvas and jersey cards. I really like the UD Portrait cards! I saw numbered blue and gold parallels of this subset at my hobby shop and they look even nicer! Nice product that is in my price range! Picked up a tin today! Nice break! Thanks for the review! I really like the portrait cards! Really like the UD series cards and nice review! Really nice boxbreak! Love Upper Decks photos in there Series boxes! I really like series 2 this year mostly because I find they did a really good job on insert design and a very clean design on the rookie materials. Nice box the nurse and andrighetto are nice! Nice box congrats! im Grant on youtube to. I always loved Upper Deck! I really like that Nurse rookie and also that Hasek jersey card! The UD Series 1 and 2 are products I can't not buy. I have to get them. It's a fun break and never disappointing like some other high end products. I really enjoy series 1 better buy you got some decent cards.. 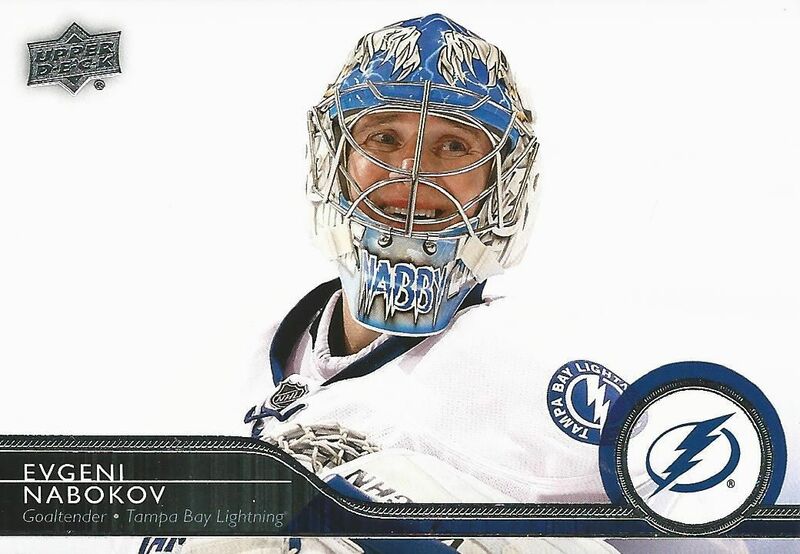 I really love the look of the UD Portraits inserts, really sharp looking. They're definitely my favourite of the inserts as well. Also great photography as always. Nice review! + Series 2 is continuing on a good Series 1 product, and is helped with some good Young Guns to get. + The portrait cards looks pretty cool. 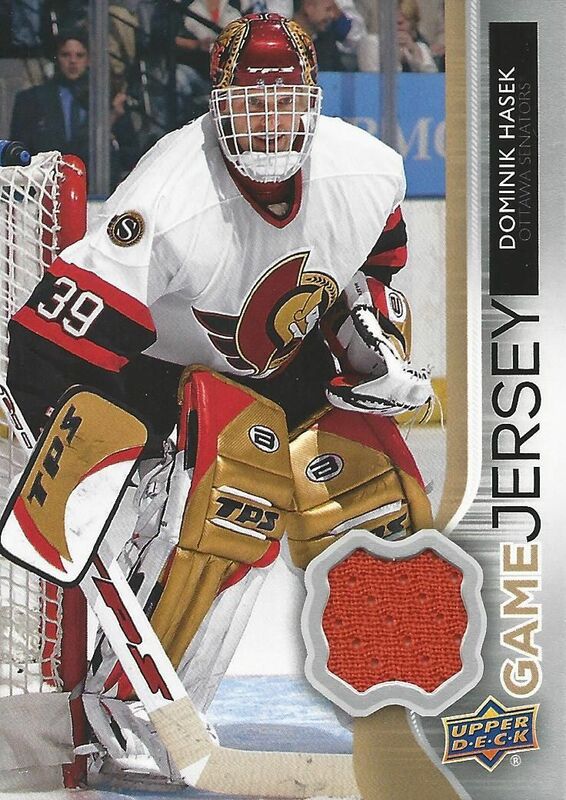 - I don't think you should release a Hockey Heroes 2010's insert set until the decade is over.